A year ago, I dove in. Almost literally. It wasn't actually until March that I took my first literal dive, but I made the decision a year ago. I learned how to scuba dive. Whoa. It's been a pipe dream of mine for a while. It was a hypothetical ambition. *Someday* I wanted to learn to scuba dive. Scuba diving in the Great Barrier Reef is on my bucket list. But the super-far-into-the-future bucket list. But around last Christmas/New Years, I decided to do it. I did the research. I found classes in my area. I even (kind of) talked a friend of mine into taking the class with me! 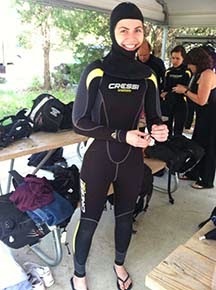 I learned how to scuba dive. It was on my life to-do list, and I did it. I checked something off my list. Somedays, when I feel like I'm not making progress toward a goal or like I have nothing to show for the nearly 27 years I've been around, I remind myself that I know how to scuba dive. We've got lots of places, and Dante will go with you! Come visit me!